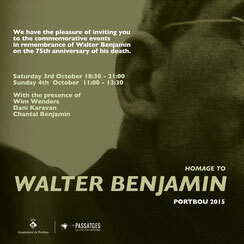 On the 3rd and 4th October have been held in Portbou the Commemorative Events in remembrance of Walter Benjamin on the 75th anniversary of his death. The event was jointly organised by our association, the Portbou town hall, Memorial Democràtic of Generalitat of Catalonia and the Consell de Diplomàcia Pública of Generalitat de Catalonia (DIPLOCAT), with the support of Diputació de Girona and the Patronat de Turisme de la Costa Brava de Girona and the collaboration of Rencontres Cinématographiques de Cerbère-Portbou and Cineimaginaire d'Argelès-sur-Mer. The commemorative event started on Saturday 3rd October at 18:30 with a dialogue between Dani Karavan, creator of Passages and the filmmaker Wim Wenders about the relationship between Walter Benjamin’s philosophy and the artistic works of Dani Karavan and Wim Wenders. On Sunday 4th October at 11:00 at La Congesta and at noon at the Cemetery in Benjamin’s Symbolic grave took place the Homage to the philosopher with the presence of Dani Karavan, Wim Wenders, Chantal Benjamin and authorities.